Quiet time, dead time, free time—call it what you will, there seems to be less and less of it. What do people give up in the race to maximize every second of their waking life? What kinds of activities are replaced by the panicked drive for efficiency? 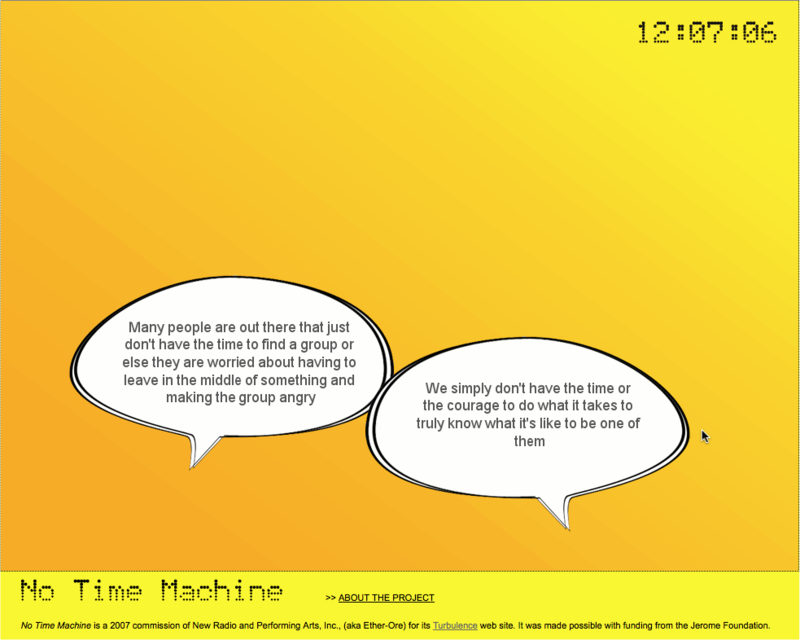 No Time Machine explores these questions by mining the Internet for mentions of the phrase “I don’t have time for” and variations such as “You can’t find the time for” and “We don’t make time for.” Based on a set of procedures we’ve set up, a program analyzes the search results and reconstructs them into a poetic conversation. Interwoven with this “found poetry” generated by the program are sentences that we re-contextualized ourselves; a human-computer collaboration that expands the field of creative writing to include networked and programmable media.